The engineered DNA-binding molecule-mediated chromatin immunoprecipitation (enChIP) technology enables purification of specific genomic regions interacting with their associated molecules. In enChIP, the locus to be purified is first tagged with engineered DNA-binding molecules. An example of such engineered DNA-binding molecules to tag the locus of interest is the clustered regularly interspaced short palindromic repeats (CRISPR) system, consisting of a catalytically-inactive form of Cas9 (dCas9) and guide RNA (gRNA). Subsequently, the tagged locus is subjected to affinity purification for identification of interacting molecules. In our previous studies, we developed enChIP systems for analysis of mammalian genome functions. Here, we developed an enChIP system to analyze bacterial genome functions. We generated a plasmid inducibly expressing Streptococcus pyogenes dCas9 fused to a 3xFLAG-tag (3xFLAG-dCas9) in bacteria. Inducible expression of 3xFLAG-dCas9 in Escherichia coli was confirmed by immunoblot analysis. We were able to purify specific genomic regions of E. coli preserving their molecular interactions. The system is potentially useful for analysis of interactions between specific genomic regions and their associated molecules in bacterial cells to understand genome functions such as transcription, DNA repair, and DNA recombination. To understand the regulatory mechanisms underlying genome functions such as transcription, it is essential to identify the molecules associated with a genomic region of interest in vivo. The engineered DNA-binding molecule-mediated chromatin immunoprecipitation (enChIP) technology we developed recently, enables specific isolation of genomic regions of interest interacting with their associated molecules [1, 2]. Examples of such engineered DNA-binding molecules to tag the locus of interest are transcription activator-like proteins  and the clustered regularly interspaced short palindromic repeats (CRISPR) system [4, 5] consisting of a catalytically-inactive form of Cas9 (dCas9) and guide RNA (gRNA). Subsequently, the tagged locus is affinity-purified to identify interacting molecules. A locus of interest can be tagged in the cell by expressing engineered DNA-binding molecules [1, 2, 6–9] (in-cell enChIP) or in vitro using recombinant or synthetic engineered DNA-binding molecules [10, 11] (in vitro enChIP). After purification of the locus of interest, mass spectrometry (MS), RNA sequencing, and next-generation sequencing (NGS) can be used to identify proteins [1, 2, 6], RNAs , and genomic regions [9, 11] binding to the locus in a non-biased manner. Previously, we developed enChIP systems for analysis of mammalian genome functions. Here, we report development of an in-cell enChIP system for bacterial cells (Fig. 1a). The system consists of plasmids expressing Streptococcus pyogenes dCas9 fused to a 3xFLAG-tag (3xFLAG-dCas9) and gRNA in bacteria. The developed enChIP system isolated target genomic regions from Escherichia coli. The system might enable identification of molecules associated with a specific genomic region in bacteria, and thus help to elucidate their genome functions. To construct the doxycycline (Dox)-inducible 3xFLAG-dCas9 expression plasmid 3xFLAG-dCas9/p-bacteria (Addgene #64325), pdCas9-bacteria (Addgene #44249)  was digested with BglII and BstZ17I and treated with bacterial alkaline phosphatase (E. coli C75) (2120A, Takara-Bio). The double-strand DNA (dsDNA) containing the coding sequence of the 3xFLAG-tag and the N-terminal portion of dCas9 (agatctaaagaggagaaaggatctATGGACTACAAAGACCATGACGGTGATTATAAAGATCATGACATCGATTACAAGGATGACGATGACAAGCTCATGGATAAGAAATACTCAATAGGCTTAGCTATCGGCACAAATAGCGTCGGATGGGCGGTGATCACTGATGAATATAAGGTTCCGTCTAAAAAGTTCAAGGTTCTGGGAAATACAGACCGCCACAGTATCAAAAAAAATCTTATAGGGGCTCTTTTATTTGACAGTGGAGAGACAGCGGAAGCGACTCGTCTCAAACGGACAGCTCGTAGAAGGTATAC) (underlined: 3xFLAG-tag; italic: dCas9) was synthesized (Invitrogen) and digested with BglII and BstZ17I. The cleaved pdCas9-bacteria and the synthetic DNA fragment were purified by agarose gel electrophoresis and ligated. To construct vectors for expression of gRNAs, pgRNA-bacteria (Addgene #44251)  was digested with SpeI and HindIII and treated with bacterial alkaline phosphatase (E. coli C75). The dsDNA for targeting the lacZ gene (ACTAGTGCTCTGCTACCTGCGCCAGCGTTTTAGAGCTAGAAATAGCAAGTTAAAATAAGGCTAGTCCGTTATCAACTTGAAAAAGTGGCACCGAGTCGGTGCTTTTTTTGAAGCTT) (underlined: the target sequences) was synthesized (Invitrogen) and digested with SpeI and HindIII. The cleaved pgRNA-bacteria and the synthetic DNA fragment were purified by agarose gel electrophoresis and ligated. For construction of gRNAs targeting the promoter region of the rpoH gene, oligodeoxyribonucleotides (Table 1) were synthesized, annealed, and phosphorylated. Combination of oligodeoxyribonucleotides was; E. coli gRNA common: 27816 + 27817; rpoH p 158–180: 27818 + 27819; rpoH p 184–206: 27820 + 27821. The annealed dsDNAs were subjected to ligation reactions with the SpeI and HindIII-digested pgRNA-bacteria plasmid. DH5α (9057, Takara-Bio) was transformed with 3xFLAG-dCas9/p-bacteria alone or together with gRNA expression plasmids, and transformed bacteria were selected with chloramphenicol (Cam) (25 µg/ml) for 3xFLAG-dCas9/p-bacteria alone or a combination of Cam (25 µg/ml) and ampicillin (Amp) (50 µg/ml) for 3xFLAG-dCas9/p-bacteria plus gRNA expression plasmid. DH5α transformed with 3xFLAG-dCas9/p-bacteria was cultured in 2 ml of LB media containing Cam (25 µg/ml) at 37 °C overnight with shaking. One hundred microliters of the culture liquid was mixed with 900 µl of LB media containing Cam (25 µg/ml) and incubated for 1 h with shaking. Subsequently, Dox (2 µM) was added to the culture media for induction of expression of 3xFLAG-dCas9. After incubation with shaking for 4 h, 400 µl of the culture liquid was centrifuged at 5000 rpm for 1 min, and the bacterial pellets were suspended in 100 µl of 4× SDS buffer. After boiling at 100 °C for 5 min, 10 µl of the sample was subjected to SDS-PAGE with a 5–20% gradient gel followed by immunoblot analysis with anti-FLAG M2 antibody (Ab) (F1804, Sigma-Aldrich). DH5α cells transformed with 3xFLAG-dCas9/p-bacteria alone or together with a gRNA expression plasmid were cultured in 5 ml of LB media containing Cam (25 µg/ml) (3xFLAG-dCas9/p-bacteria) or Cam (25 µg/ml) plus Amp (50 µg/ml) (3xFLAG-dCas9/p-bacteria and a gRNA expression plasmid) overnight at 37 °C with shaking. The bacterial culture was added to 100 ml of LB media containing the same antibiotics and cultured at 37 °C with shaking. When OD600 of the culture media reached 0.5, Dox (2 µM) was added for induction of 3xFLAG-dCas9 expression. After incubation at 37 °C for 4.5 h with shaking, the bacterial cells were fixed with 1% formaldehyde at 37 °C for 5 min and neutralized with glycine at room temperature for 10 min. After centrifugation, the cell pellets were suspended in 800 µl of modified lysis buffer 3 [10 mM Tris, pH 8.0, 1 mM EDTA, 0.5 mM EGTA, 150 mM NaCl, 0.1% sodium deoxycholate, 0.1% SDS, and 1 × protease inhibitors (Complete-Mini, EDTA-free, 11836170001, Roche)], and DNA was fragmented by sonication using Ultrasonic disruptor UD-201 (TOMY SEIKO) with conditions: Output, 3; Duty, 100% (continuous); Time, Free; 6 cycles of sonication for 10 s and cooling on ice for 20 s (the average length of chromatin fragments was 1 kbp). The sonicated chromatin was subjected to enChIP-real-time PCR analysis as described previously [1, 2]. Primers used in the analysis are shown in Table 1. 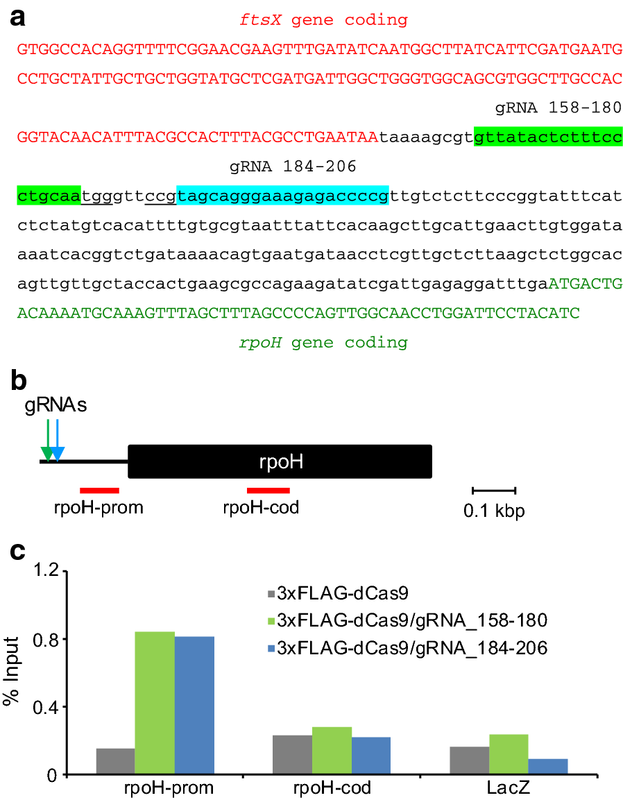 To analyze the locus-specific functions of the bacterial genome biochemically, we constructed a bacterial expression plasmid (3xFLAG-dCas9/p-bacteria (Addgene #64325)) encoding S. pyogenes dCas9 fused with the 3xFLAG-tag. The E. coli DH5α strain was transformed with 3xFLAG-dCas9/p-bacteria, and inducible expression of 3xFLAG-dCas9 by Dox was confirmed by immunoblot analysis with anti-FLAG Ab (Fig. 1b). Next, for enChIP analysis, we designed a gRNA targeting the coding region of the lacZ gene (Fig. 1c). We transformed DH5α with 3xFLAG-dCas9/p-bacteria together with a gRNA expression plasmid targeting the lacZ gene in the DH5α genome. Four hours after the addition of Dox (2 µM), cells were crosslinked with formaldehyde and subjected to sonication for fragmentation of chromatin DNA. Next, chromatin complexes containing 3xFLAG-dCas9/gRNA were immunoprecipitated with anti-FLAG Ab, and DNA was purified. Real-time PCR showed enrichment of the lacZ gene (Fig. 1c, d). The percentage of input of negative control genomic regions (the crp and lacI genes) was markedly lower than that of the lacZ gene (Fig. 1d). These results showed that the bacterial enChIP system can specifically and efficiently isolate target genomic regions. Next, we targeted the promoter region of an endogenous gene, rpoH, which encodes RNA polymerase sigma (32) factor . This gene is a single operon gene and one of the essential genes of E. coli [Profiling of E. coli Chromosome (PEC): https://shigen.lab.nig.ac.jp/ecoli/pec/]. First, we designed two gRNAs targeting the promoter region of the rpoH gene (Fig. 2a). Next, we transformed DH5α with 3xFLAG-dCas9/p-bacteria alone or together with one of two gRNA expression plasmids targeting the promoter region. After enChIP, real-time PCR showed that the promoter region of the rpoH gene was specifically enriched only in the immunoprecipitants prepared from DH5α cells transformed with both 3xFLAG-dCas9/p-bacteria and either one of two gRNA expression plasmids, but not from those transformed with 3xFLAG-dCas9/p-bacteria alone (Fig. 2b, c). The percentage of input of negative control genomic regions (the coding region of the rpoH gene or the lacZ gene) was markedly lower than that of the rpoH promoter region (Fig. 2b, c). These results confirmed that the bacterial enChIP system can specifically and efficiently isolate endogenous target genomic regions. In this study, we developed an enChIP system for analysis of bacterial genomes. This system enables efficient isolation of specific genomic regions from the E. coli genome while preserving their chromatin structures, and potentially contributes to the understanding of bacterial genome functions such as transcription and DNA repair. Further studies might be necessary to assess the utility of this system combined with MS and NGS to identify molecules associated with the target genomic regions in bacteria. HF conceived the idea of development of an enChIP system for analysis of bacterial genome functions and constructed expression plasmids. TF and HF designed and performed experiments and wrote the manuscript. MY performed experiments. HF directed and supervised the study. All authors read and approved the final manuscript. We thank Stanley Qi for pdCas9-bacteria (Addgene #44249) and pgRNA-bacteria (Addgene #44251). TF. and H.F. have patents on enChIP (Patent name: Method for isolating specific genomic region using molecule binding specifically to endogenous DNA sequence; Patent number: Japan 5,954,808; Patent application number: WO2014/125668). T.F. and H.F. are founders of Epigeneron, Inc.
All data generated or analyzed during the current study are included in this published article. This work was supported by the Takeda Science Foundation (T.F. ), Grant-in-Aid for Scientific Research (C) (#15K06895) (T.F. ), and Grant-in-Aid for Scientific Research (B) (#15H04329) (T.F., H.F.), ‘Transcription Cycle’ (#15H01354) (H.F.) from the Ministry of Education, Culture, Sports, Science and Technology of Japan.